Good day everyone. It has been a couple of weeks since I did one of these columns as there was not much last week. This week however has some definite stand outs. Starting with the return of The Tick to Amazon Prime. The second half of season one dropped on Friday on the streaming service and made for a quick and extremely funny binge. The Tick left off with the presumed dead Terror having kidnapped Arthur, leaving the Tick aimless and scared for is sidekick. The season jumps right back into that and we get all kinds of weird and wondrous stuff such as Midnight, the talking dog with star and stripes sunglasses, Danger Boat which has fallen in love with Arthur (including a remarkably awkward shower scene), the giant, naked walking man actually tying into the overall series arch, the first utterance of “spoon” from the Tick, and the Tick asking Arthur the age old question, “Am I a yeti?” The Tick is absurdist fun and a deconstruction of the super hero genre, while also propping it up in what has to be considered a love letter to the genre. The cast is magnificent and the binge flies by easily. Treat yourself to a big. blue slice of justice with the Tick! And if that wasn’t enough evil fighting for you, Ash vs. the Evil Dead returned this weekend as well on Starz. Ash seems to be happy and opening up a hardware store in his hometown, but little does he know that evil was coming back with a vengeance. We meet a new character, introduced to us as Ash’s unknown daughter. I just recently binged seasons one and two of this horror/comedy show and I am so happy I did. 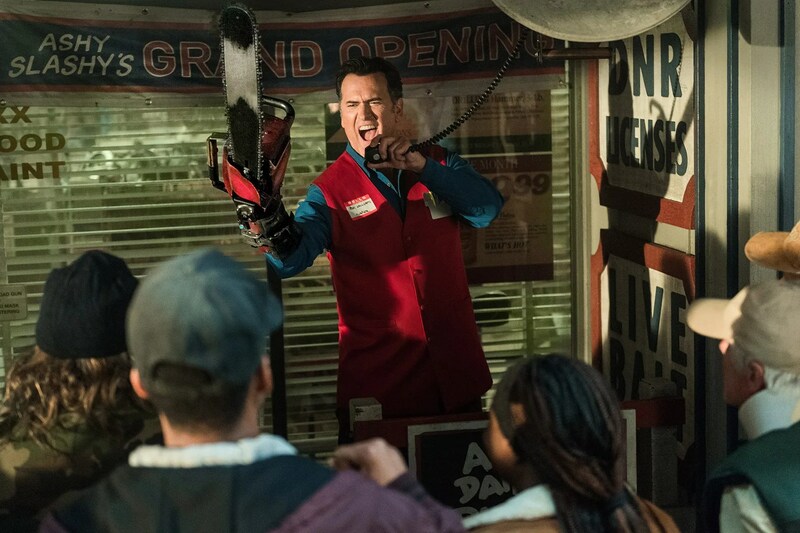 Ash vs. the Evil Dead is a complete hoot and Bruce Campbell is a master of the cheese needed to carry off this series. Match Game looks to be done for another season. Alec Baldwin does an amazing job hosting this show, despite the gignormous shoes of Gene Rayburn that he had to step into. This final pair of episodes saw one of the most shockingly funny answers of the year, sending Alec down to the ground in front of the contestants in shock. I am always amazed at how raucous this show has been and I will miss laughing at it every week. Perhaps it has been moved somewhere else but I know that Designated Survivor will be returning to the Match Game time slot. I am sure Match Game will return in the future. Tonight, The Walking Dead will return from its winter break to end the story of Carl, who, when last we saw him, had revealed to his father that he had been bitten by a Walker. We all know what that means… Carl is doomed. One of the few remaining original cast members, Carl has not always been the most popular character. However, it seemed that with his fate sealed, the thoughts of Carl may have turned. The first half of season 8 of The Walking Dead has been very lackluster, with only a couple of really stand out episodes. Let’s hope that the death of Carl will be able to kick start this once brilliant series back to prominence. General Hospital had its 14,000 episode this past Friday. That is quite an achievement and, while I do not get the chance to see GH much any more, I made sure to pull this episode up on Hulu. Thing was that there was not much more to it than a regular episode. There was some interesting drama involving Sonny and his father Mike, who has been diagnosed with Alzheimer’s Disease. There was also some unintentionally funny parts where Sonny apparently mispronounces the disease every time he says it. The Winter Olympics came to a conclusion after a couple of weeks of entertaining action in South Korea. And while the US Female Ice Skating team flopped like few other US teams have done before, the US Curling team brought back gold. No, really…USA Curling. Funny enough, the US Curling team was actually rewarded with the Gold medals for the Wonen’s curling. The mix up was fixed and the US team did receive their proper gold medals. It looks as if several of my favorite shows will be making their way back this week from hiatus. Not only will The Walking Dead be back, but so will Agents of Shield, The X-Files, Designated Survivor, Scandal and How to Get Away with Murder (those last two having a Shondaland crossover event this Thursday). The week after will see Riverdale return as well so the TV landscape is looking to get busy again. This entry was posted in TV-G[eek]. Bookmark the permalink.